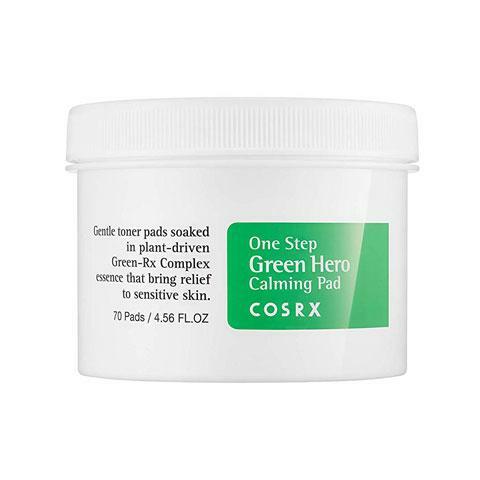 COSRX One Step Green Hero Calming Pad contains an essence made of 75% Green Tea, 10% Green-RX Complex and 0.25% Lactobionic Acid (PHA) to achieve a smooth texture and to keep your skin calm. Use as a daily toner to refresh your skin, or just before makeup for a smoother application. 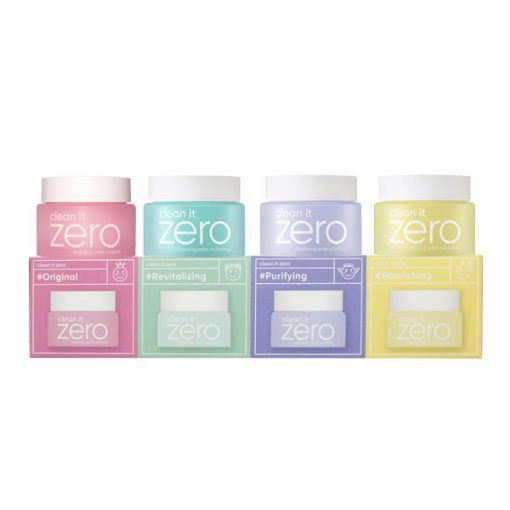 These pads have a pH level of 4.5 and are suitable for all skin types. Highly recommended for sensitive skin. If you purchase this product you will earn 30 Points! These calming pads keep your skin calm, fresh and protect it with antioxidants from Green Tea Leaf Water. A Green-RX Complex consisting of 5 plant extracts: Oriental Dandelion Leaf, Centella Asiatica Extract, Witch Hazel Extract, Tea Tree Leaf Extract and Mugwort Extract help keep your skin clear. This Green-RX Complex also creates a skin-soothing solution for sensitive skin and reduces redness. Mint Extract provides a cooling effect as well as refreshes tired-looking skin. COSRX One Step Green Hero Calming Pad uses PHA to gently remove dead skin cells and smooth your skin. Green Tea Leaf Water – contains healing and antibacterial properties that heal blemishes, inflammations, scars and acne. Green-RX Complex – made of 5 plant extracts which have skin soothing and calming properties. These extracts also strengthen your skin barrier as well as cleanse and revitalise your skin. PHA – poly hydroxy acids. Chemical exfoliators that are more gentle than AHAs and BHAs but effectively remove dead skin cells. They contain anti-oxidants and help prevent signs of premature ageing, stimulate collagen production and repair damaged skin. Mint – has a refreshing, cooling effect on the skin. This herb naturally contains Salicylic Acid therefore helping to control sebum production. It also has strong antibacterial properties. Discover our wide range of COSRX here. After cleansing, carefully take one pad from the case. On the embossed side of the pad, gently sweep across your entire face in an outwards direction. Avoid the eye area. Turn the pad over and sweep over your entire face with the softer side. Follow with the rest of your skincare routine. Place a pad on targeted parts of your face e.g. each cheek, forehead. Pat in the essence and follow with the rest of your skincare routine. Note: Use these pads 1-2 times daily during the toner step of your routine. Please also keep the lid of the case tight to avoid the pads drying out. Do not use BHA products if you are allergic to aspirin.